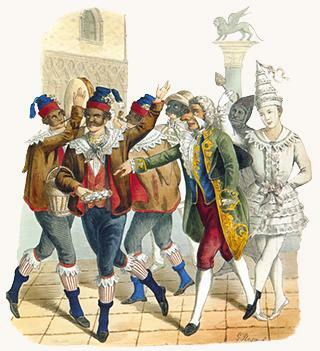 The Carnival in Venice is said to have originated from an important victory of the "Repubblica della Serenissima" (how it was called the town of VENEZIA in those times), in the war against Ulrico, Patriarch of Aquileia, in the year 1162. To celebrate this victory, dances and reunions started to take place in San Marco Square. Of course, how it was usual in those times, and due to the multicultural character of Venice, magicians and others joined the fun. Some for business, some for fun only. We should not forget that at the time Venice was a rather powerful small republic, center of much traveling inside Italy and on the road to China. At the beginning this celebration that started the day after Christmas went on for several centuries until the 17th century came, rejoicing in music, culture, rich garments and a growing middle class. And this is more the Carnival we know, to which we relate more. The music of Vivaldi, the masks, the beautiful and mysterious women, craziness and treason, all together.